These sweet and salty popcorn cookies are so satisfyingly tasty. You get crunch, you get sweet, you get saltiness, and you get chocolate, all in the guise of a little mini popcorn ball of a cookie. The best part of these cookies is that you can have five or six of them, as opposed to one or two "regular" cookies. They are pretty much all air, right? That's my story and I'm sticking to it. Another advantage to making these cookies is that you don't have to fire up your oven! The only cooking involved is making browned butter and melting the marshmallows that hold the goodness together. Browned butter you ask? Just about the best secret ingredient to add a tasty nutty flavor to your treats. There are several ways you can eat these cookies. You can pull them apart piece by piece, and eat each component. You can just bite into these and play "salty sweet lottery." 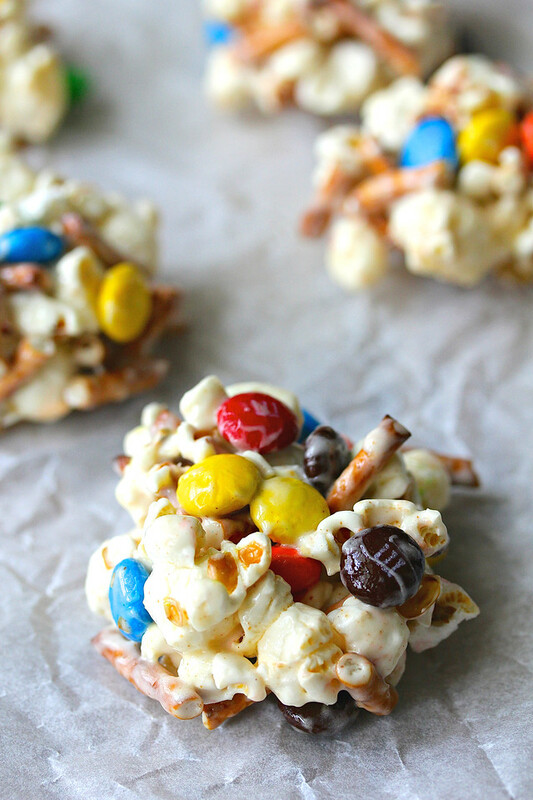 OR, you can grab little bits of each component, making sure you get popcorn, chocolate, and pretzel in each bite. I leave it up to you my friends. You can air pop the popcorn, but I prefer popping it in a pan or a wok with oil. For cooking popcorn in a pot, check out this post. When I made the popcorn for these cookies, I ended up with only 3 unpopped kernels using this method. Woo! 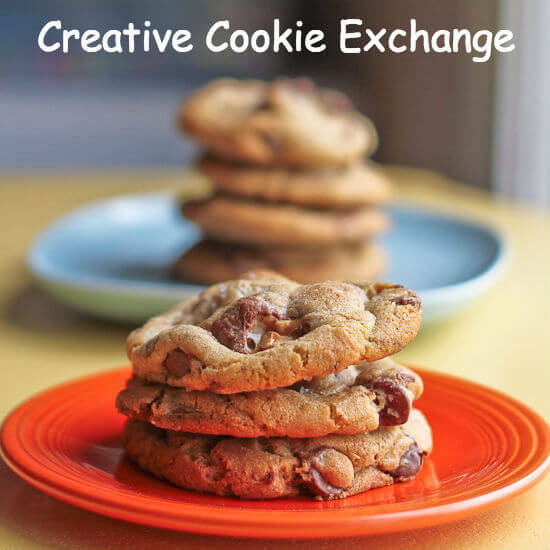 After the recipe, there are more links to delicious no-bake cookie recipes from the members of the Creative Cookie Exchange. Recipe very slightly adapted with permission from the wonderful blog Foodie with Family by Rebecca, who just happens to be coming out with her own canning book! Line two baking sheets with parchment or Silpat and set aside. Roughly break the pretzel sticks into three or more pieces each and add them to a large mixing bowl. Set aside. Pop the popcorn and pour it into a bowl. Using your hands, gently break up some of the popcorn so that about 1/3 of it is in smaller pieces. Add the popcorn to the bowl of pretzel pieces, making sure you are not adding any unpopped popcorn kernels. In a 3 quart sauce pan, melt the butter over medium low heat. Continue to cook until the butter just begins to turn golden brown. Add the marshmallows and stir them into the butter. Lower the temperature and continue to cook, stirring constantly, until the marshmallows are fully melted and incorporated. The mixture should be smooth. 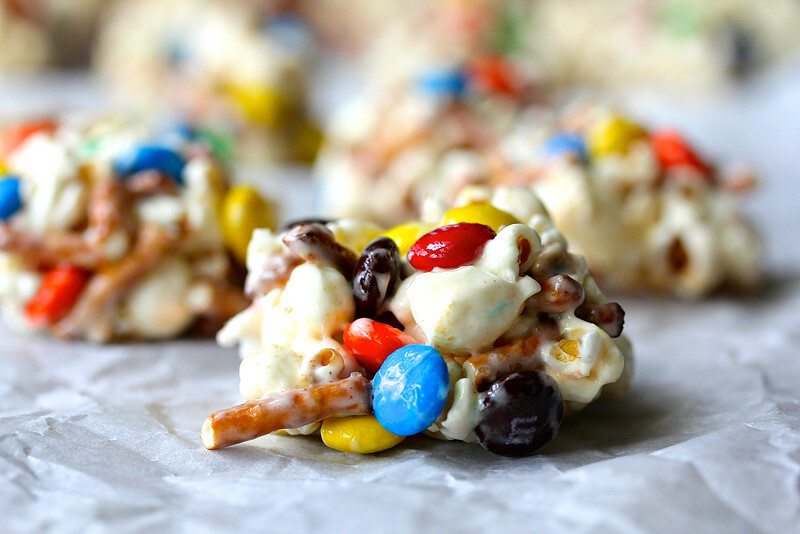 Pour the marshmallow mixture over the popcorn and pretzel mixture and stir to coat everything thoroughly. Add the chocolate candy and stir until evenly distributed. Spray your hands with spray oil and gently form 1/3 to 1/2 of a cup of the popcorn mixture into a ball and then flatten slightly into a thick cookie shape. Place on the parchment lined baking sheet. Continue forming cookies until the mixture is gone. Totally could eat six of these at one time. And go back for more. Yum! They look live really cute treat! These would definitely satisfy my sweet (and salty) tooth! What a great combination of ingredients! I'll take 3, well maybe 4, oh heck I'll go with Renee and take 6! I won't tell, ha ha! I think these cookies are calling my name. I love sweet & salty! Thank you! The balance was surprisingly good! Sweet and salty -- so yummy!! I can't wait to try these! 5 or 6? Who are we kidding, missy? Ha ha! That's why I took them to work! And the popcorn is a whole grain, right? When you have a moment please stop by and check out my Mango-bango-Cheesecake. Oh my! 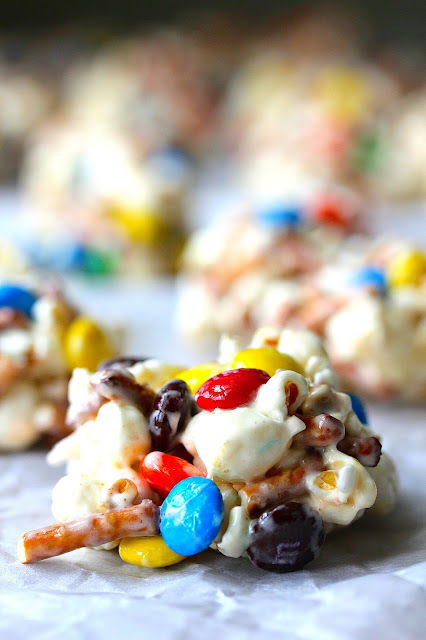 These are like popcorn ball rice krispie treat balls all wrapped up in one sweet little cookie! I could eat a couple right now, it's 11am and I'm in need of sweetness!